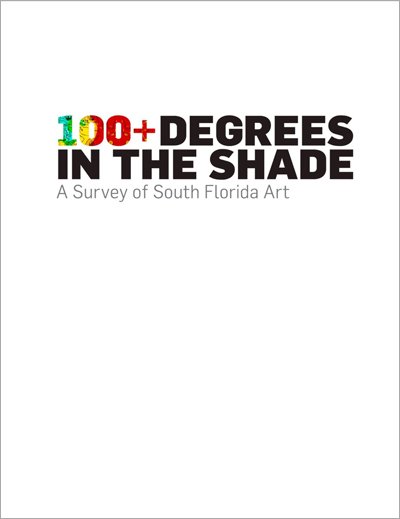 This full color (over 150 color plates), 210 page hardcover book is being published to commemorate the 2015 multi-venue exhibition 100+ Degrees in The Shade: A Survey of South Florida Art. [NAME] Publications is pleased to offer a pre-release copy of the book at a discounted price of $10 available until November 1, 2015. The full price after pre-release will be $25. The expansive show will include an array of works in all media, by a selection of some of the finest artists of South Florida. Sculpture and installation works, painting, photography, mixed media and works on paper, as well as video and performance are included. The breadth of this exhibit will be both inclusive and discerning, with an emphasis on innovation, impact, and inspiration, in ways which are integral to the lush, tropical-urban environment that exemplifies South Florida. There will be a total of over 150 participants, encompassing internationally and nationally known established, mid-career and emerging artists included. Organized by independent curator Jane Hart with 30+ years experience in the international contemporary fine arts. Additional assistance provided by Nina Arias and Chris Ingalls. Book design by Misael Soto.